Also taking part were Peter Thiele, Head of Division Policy Issues of Initial and Continuing Vocational Training at the BMBF, Cedefop’s Head of Communication Gerd-Oskar Bausewein and Cedefop expert Kostantinos Pouliakas. The delegations shared insights into how vocational education and training (VET) could become a more attractive learning sector to help more people acquire skills needed to make them employable, but also to ensure that Europe supplies a competitive workforce to the labour market to generate more new jobs, continuous training and better matching between qualifications and skill needs. Unemployment and lack of basic skills still severely undermine competitiveness and social cohesion. Another topic was the ongoing discussion about the New skills agenda for Europe and Cedefop’s future role. The skills agenda will provide new and diverse challenges for VET stakeholders. Cedefop will support the frameworks that will make implementation in Member States easier by striking a balance between its strategic multi-annual objectives of creating new knowledge, sustaining policy analysis and brokering knowledge among stakeholders. Increased communication outreach activities are important to support more attractive VET systems. Both sides agreed that Cedefop’s role as a catalyst on a European level is crucial, and sharing expertise, good practice, common tools and activities a step towards supporting European VET in the areas of skills, qualifications, outreach activities and advocacy. The Cedefop delegation also had an exchange of views on the skills agenda and Cedefop’s strategic multi-annual objectives with Barbara Dorn, Confederation of German Employers' Associations (BDA), Mario Patuzzi, German Trade Union Confederation (DGB), Christian Sperle, German Confederation of Skilled Crafts (ZDH) and Barbara Fabian, Association of German Chambers of Industry and Commerce (DIHK). 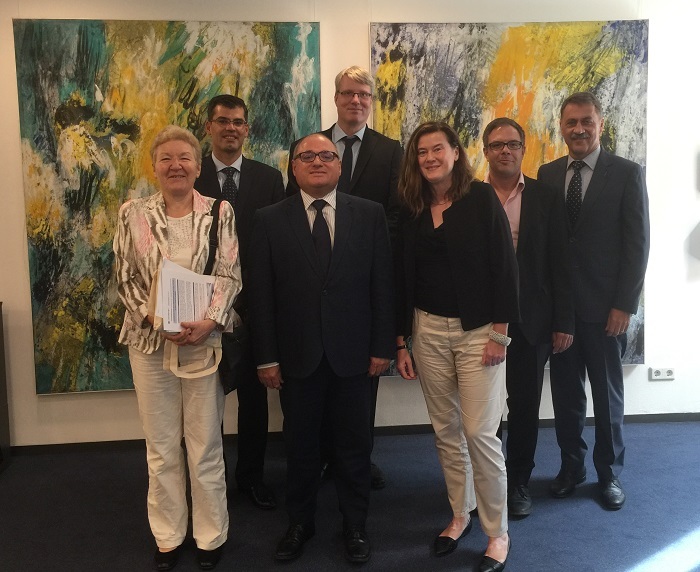 The meeting was held at the BDA premises in Berlin. As a tripartite agency, social partners play a key role in Cedefop’s Governing Board and in the activities that the agency organises in Thessaloniki and in Member States. The high-level delegation of German social partners was briefed on Cedefop’s proposed new tasks as a result of a revised Founding Regulation, the project on governance of EU skills anticipation and matching systems as well as the ongoing outreach activities, particularly the communication support of the European VET skills week in close collaboration with the European Commission. The special relationship between Cedefop and social partners offers added value in the promotion of VET systems that bridge the divide between education and training and the labour market. Cedefop is at the interface between education and employment, and social partners have a pivotal role in encouraging learning in workplaces, in sharing innovation with education and training institutions and in making work-based learning a reality in processes leading to qualifications. More Erasmus+ funding will enable employers, particularly SNEs and training providers, to establish a closer rapport that could lead to more work experiences for young people in industries closer to their community. The German social partners reiterated their support to Cedefop’s work which is now more visible and addressing more closely their needs to make VET more attractive and relevant to employment. Bringing evidence on the development of national policies from 33 countries, the study examines progress made in recent years (2009 onwards) and attempts to capture the character of political reform at national, institution and local levels. Ten case studies in nine countries produce new empirical evidence on the presence of learning outcomes approaches in the design and delivery of programmes and curricula for teacher education programmes. Based on extensive literature review, interviews conducted with various stakeholders in curriculum policy-making and practice, focus groups and on-site visits, findings show how learning outcomes approaches increasingly feature as catalysts for policy and practical reform, influencing education and training practice. This publication also reveals the diversity of uses of the learning outcomes approaches being applied and highlights the complexity of implementing learning-outcomes-centred policies and developing appropriate strategies at both systemic and subsystemic levels. The narrative accounts describe the wide variety of experiences with initial and further education. The analysis focuses on motivations for learning (or not) and the findings confirm that early negative experiences with schooling have a scarring effect inhibiting workers’ willingness to re-engage in education later in life. Nevertheless, many low-educated adults command a variety of skills, which they have developed in the work context, while the interest of the low-educated in education and training may be rekindled by making learning instrumental to improvement in their work situation. The second Policy Learning Forum (PLF) on the writing of learning outcomes in VET will build on the positive experiences from the 2015 PLF on the same topic, further deepening the exchange of experiences between national experts in this area. This joint Cedefop-UNESCO global skills conference aims to discuss the implications of global economic trends and market forces for anticipated skill needs and mismatches, and the responses of education and training systems building on labour market intelligence. The 14th ReferNet annual Plenary meeting will welcome the 30 new partners under the 2016-19 Framework Partnership Agreement, and the ‘National representatives’ in charge of validation. The meeting will aim at informing on the latest EU VET policy developments, preparing the 2017 Work plan and sharing experience on the scope and process of validation. VET policy reporting, the Mobility Scoreboard and the Thematic perspective on outreach and guidance will feature on the agenda. Various cooperation models such as knowledge-sharing on EU VET policies, peer review, hands-on workshops and joint reflection will be used. Cedefop is organising a policy learning forum (PLF) on developing teachers and trainers’ competences for better learners’ skills in vocational education and training (VET). Cedefop will present the existing evidence on policies and practice to support initial and continuing professional development of VET teachers and trainers in enterprises to address today’s challenges and ensure quality VET, especially in the context of work-based learning and apprenticeship. The participants will exchange and share the experiences from their countries through the interactive environment and networking opportunities. They will represent national, regional and local authorities, social partners, teacher professional associations, practitioners and other stakeholders.